It’s been a difficult week so far. No need to go into details, but there have been several occasions cope and a few to mourn or rejoice. Highs and lows. Being alive means having to deal with death and suffering and there are periods when tragedy and difficulties come with more frequency. Thank God for the garden. Plants give us the opportunity to cultivate life. We are reminded to embrace any and all occasions for growth. Flowers lift our hearts and their colors elevate our spirits. As human beings we get the full experience, like it or not. We plant and muddle through…grieve and grow. One lovely thing that happened today: I arrived home to find a box on my doorstep. 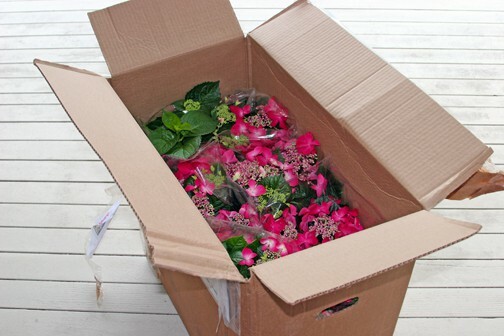 It was filled with Strawberries and Cream Hydrangeas. Yea! One to keep and several to share.